5 Essential Steps to Bring Converting In-House. In today’s economy, it is important to discover ways to save some money and conducting some of the services that you outsource is the best way to do that. If you are a manufacturer who outsources converting (the process of cutting master rolls of material to 2 or more smaller rolls) services, it could benefit you to begin thinking about the steps to bring that part of your process in-house. Here are 5 important steps to bring your converting process in-house. 1.) Analyze what you are currently paying for the converting work to be done by someone else. Contract converters will charge for everything from machine set-up to slit method, number of master rolls, number of child rolls, specific delivery time, material storage, etc. Learn exactly what you are being charged for and determine the savings that you can incur by bringing converting in-house. 2.) Determine and learn specific elements of the process that is done by your service provider. Are you sure of the specifics of the converting project? Learn how your material is being converted and through which cutting method. There are several different types of slitting methods all resulting in different results in your material. Determine whether your material is being converted into sheets or being slit by a razor, score, shear, hot knife, or ultrasonic slitting method. Also, determine the slit widths and tolerances that you will be satisfied with in your finished product. 3.) Determine physical space constraints and limitations of your facility. Most converting machines run off of 3 phase 230 V power supply. The electrical availability could be different in your facility. Determine which electrical set-up you have in your facility and what it would take to add an electrical supply source if necessary. Also, keep in mind that you may be limited in available space in your facility. Carefully, map out the available space you have for a new converting machine and account for space for storing master rolls, as well as, finished rolls. Perhaps the most important thing to do when looking at an operation change like this is to determine where you are in your budget and realize that bringing in an added operation in house can save you money in the long run. Depending on how much you spend for a converting service, a seemingly larger investment now could help you save money in the future. 5.) Contact an experienced converting machine builder. There are literally hundreds of machine builders in the marketplace. Regardless of whether your material is highly specialized or more common, choose your machine builder wisely. Most converting machine manufacturers build machines with bells and whistles that you will never need and cater to various materials that you will never use in your products. Make sure that if you are in the market for a converting machine, you understand the features of the material and how it reacts to certain slitting methods, speeds, and tensions. Most importantly, make sure you are not being offered features of the machine that you will never use. 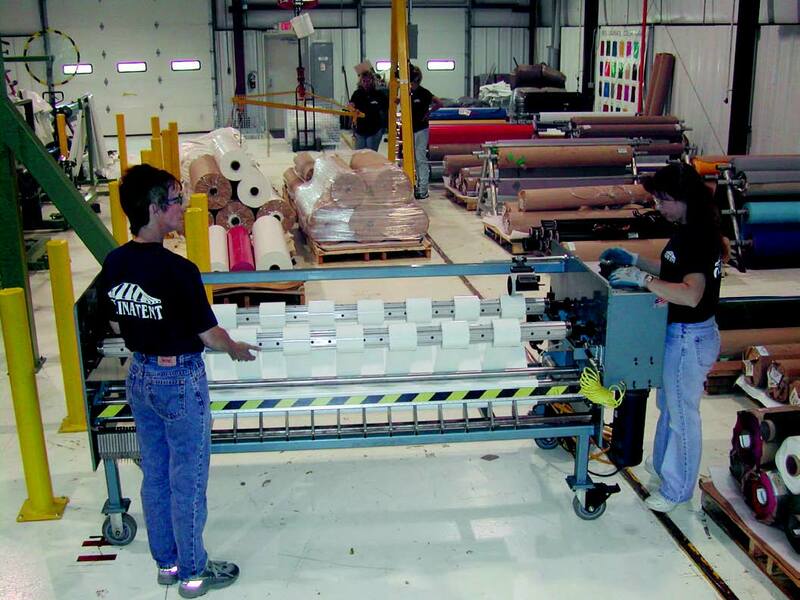 Pinnacle Converting Equipment, Inc. and one of their machines was featured in a 2005 article published by the Industrial Fabrics Association International’s Specialty Review about bringing converting operations in-house.